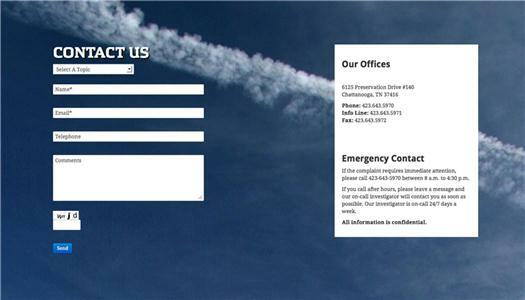 A jet-lain stripe of white cloud is featured in the contact window of the city/county pollution control bureau website. The image vanished when a CBS Radio news affiliate made inquiries about chemtrail pollution in the county. Meet Bob Colby, the director of the Chattanooga/Hamilton County Air Pollution Control Bureau whose work is paid for by Chattanooga-area taxpayers but whose mission is to enforce the view of air quality under the dictates of the U.S. government. The local face on the remote and global power sitting in Washington. I want in the upcoming Hot News Talk Radio interview the official narrative, the governmental truth, the clear imprint of public policy and law that propels — and delimits — his role. We need to see the purported story from his perspective before we go further in our explorations of stratospheric aerosol geoengineering. To see his position, we grant his good faith as a local resident who breathes the same air you do, and that if air pollution data were negative, he would raise a hue and cry. Comes to mind a biblical passage about guardians and their duty. “But if the watchman sees the sword coming and does not blow the trumpet,” says the prophet Ezekiel in the 33rd chapter of his book, “and the people are not warned, and the sword comes and takes any person from among them, he is taken away in his iniquity; but his blood I will require at the watchman's hand” (verse 6). Indeed, evidence of at least the edges of stratospheric engineering exists in the record. Aluminium, strontium and barium — said to be the main elements in U.S.-manufactured skies — are regularly present in city and county air, according to Mr. Colby’s response to my state records request. Mr. Colby dismisses these numbers as “traces,” nothing about which to be worried. Skystriping, sky tattooing, sky hacking, chemtrailing, call it what you will — remains officially a nonstory. Bob Colby’s responses to my questions, like the slivers of metal standing at attention as a magnet passes over, help steer us in our quest for the facts of local economy and its enemies. As the shavings come into line, my speculations trace the direction along which they point. That the official regulators of air pollution are a necessary distraction, a cover for a possibly dangerous, unregulated, untested aerial cloud-making weather modification program that sprays milky haze into the stratosphere to dim the sun, as you perhaps have noticed in your home city. Meanwhile, micromanagement of ground-produced fumes makes us assume that the U.S. government is just as fussy about other kinds of smoke. No government with a watchdog such as Mr. Colby on the ground could tolerate jet-lain pollution above the clouds as conspiracy theorists suggest. No national power as vigilant with leaf-burning bans and inspecting dry cleaners could conceivably ordain the depositing of millions of tons of aerosolized particles aloft that could be the unsuspected cause of oddities such as bee colony collapse and skyrocketing rates of neurological disorders among the populace. Mr. Colby was kind enough to make time for this interview June 11, 2014, in Chattanooga. Bob Colby Our mission is to achieve and maintain levels of air quality which will protect human health and safety and prevent injury to plant and animal life and to property. And we do that through a multiple sort of activities that we carry out. We do air monitoring. we have air monitors located throughout the county where we monitor certain pollutants. We have a staff of engineering folks who go out and they inspect industrial facilities, they issue permits dictating how a source is to build and what their mission limitations are, what they can and cannot do. And they do inspections every year to ensure compliance with those permit conditions. We also have an enforcement staff that goes out in response to citizen complaints, and they take care of any violations that we might find that is causing pollution that might lead to unhealthful air. David Tulis So you’re the enforcer of federal law for the benefit of Chattanooga. Bob Colby Well, actually, we only enforce local laws. There are a lot of federal regulations that USEPA has adopted that we then adopt and incorporate by reference locally so we’ll have the legal authority to enforce those. Q So your authority is really county and city, and not federal. And that’s because these local bodies as you say adopt by incorporation changes in whole bodies of law from the federal government. Bob Colby That is correct. Q And how many people work there? Bob Colby When we’re fully staffed, we have 14 and a half. Q Now tell my listener how you detect what’s in the air. You gave me, for example, a report that explained what the levels are of aluminum, barium and strontium. How is this information gathered? Bob Colby Like I said, we have monitors throughout the county and we have monitors that continuously monitor for ozone, which is a gaseous pollutant that we’re mainly concerned with during the summertime and we also monitor for particulates. And there are two types of particulate monitors that we have. One is called “fine particle” and the other is called “coarse particle.” The coarse particle is referred to as PM 10, or particulate matter of 10 microns and aerodynamic diameter, or less. And the PM 2.5 fine particles are particles that are two-and-a-half microns or less in diameter. Just so your listener will understand, the PM 10 range is between one-twenty-fifth to 100th of the diameter of a human hair. PM 2.5 is about 100th of the thickness of a human hair. Q This whole project is intended so that my listener and his wife and children will have safe air to breathe. If something is detected, then the alarm goes off and the source of that pollution is corrected by you? Bob Colby Yes, well, sometimes we can’t correct them because the fine particles with the PM 2.5 can travel up to 500 miles. So if something happens in South Alabama, it can come here and impact us and we’ll never know where it came from. Q So my listener is to understand that you are enforcing public policy, in favor of the individual, in favor of the citizenry. These devices serve that purpose, right? They serve public policy. Bob Colby I wouldn’t specify that we serve public policy. It is federal law which is required to be adopted locally. These standards are in effect everywhere. There are standards for PM 2.5. There are standards for PM 10 and standards for ozone. Those regulations are developed through the use of public policy and discussion and input, but those are laws and not public policy. Q Because there is a difference. Bob Colby I believe so. Q So when you give Chattanooga a clean bill of health as you effectively did as I received the printout from you, there is nothing to be alarmed about, you said. It is technically accurate. It is technically true. And having that clean bill of health serves the interest of the public. The public has an interest to know. You’re saving there’s nothing wrong. The air is clean. You can breathe it. You don’t have to worry about it. You don’t have to be anxious about what a talk show host may clamor about it. Bob Colby Well, as I said, EPA establishes, based on a multitude of health-based studies and the impacts that air pollution, particulate pollutants have on human health, and they set the standards; we measure those standards and are required to take whatever steps necessary to see that we are achieving those standards. Q So public policy and the public interest — in your work — they coincide? There’s no conflict between public policy and the public interest? In my mind, they are not always necessarily the same. Sometimes, public interest in injured by public policy or a compelling state interest. Bob Colby We are a regulatory agency, not a philosophical agency. Q So your job is to enforce the law, restrict unwanted pollutants that are injurious to the public health, and I have received an accurate report from you that there is no worrisome level of aluminum, or barium or strontium in the air of Chattanooga. Bob Colby There are no health-based standards for any of those. There are health-based standards for particulate matter, which those would be. Q I didn’t understand that. Bob Colby Particulate matter is made up many things. It includes elements of all sorts, and there are no health-based standards for aluminum, strontium or whatever the other one was that you are interested in. Q Well, why aren’t they measured? Bob Colby EPA has established a series of speciation monitors where they’re measuring particulate and that one particular monitor they will take those filters and they are sent off to an EPA laboratory somewhere or a contract laboratory and they look to see what is the makeup of those particles on that filter. Some of those are very helpful; we use some of them for markers for wildfires that are impacting our monitors which will then allow us to get an exemption from EPA as an exceptional event and it won’t count against us if it’s a naturally occurring event. We also use it to identify and prove to EPA for exceptional event purposes that there was a major fireworks event that significantly impacted one of our monitors, and that usually occurs right around the fourth of July. David Tulis When I asked you about chemtrails — using the popular word for that phenomenon — *** you said, our position, the official position of the United States is summarized in an EPA “aircraft contrails” fact sheet. Can you summarize what that document says? Bob Colby Well, I’ve only looked at it briefly. It says that in collaboration with NOAA, NASA, the FAA and EPA, they had determined that persistent contrails are natural phenomenon that occurs at high altitudes from jet engines when the relative humidity levels are high in the upper atmosphere and the water vapor that comes out of the jet engines turns to ice particles, and then those ice particles, and then those ice particles grow larger as they collect moisture in the upper atmosphere that’s there in excessive amounts. And they also said there are trace amounts of hydrocarbons, nitrogen dioxide, and the sulphur in the jet aviation fuel. *** And the jet fuel has to meet very high specifications for cleanliness in order to fly those big jets. Q I’ve heard people discuss that the emissions from planes don’t come from the engines. The seem to come from nozzles. There are many programs online that show weird nozzles on the sides of planes. On my website I have posted a quite famous two-minute video of some pilots following another plane that is turning its spray nozzles on and off. This kind of material is widely available and frightens many people. Bob Colby We have no position, because we are not aware of it. And even if it were occurring, we would have no jurisdiction whatsoever because we are responsible for ambient air, which is the air people can breathe down here. We have absolutely no jurisdiction over aircraft. That’s reserved in the Clean Air Act, and jet aircraft engines and the fuel nationwide as a matter of fact, of all types of vehicles, is the exclusive jurisdiction of the U.S. environmental protection agency. Q So, in your official position, insofar as the reach of your authority and the scope of your gathering particles for testing, there’s nothing — that’s something outside your notice. Bob Colby Absolutely. *** I was going to say that there’s been a great deal of interest in this topic. Anyone can go online and any one of your listeners can go online and just google “persistent contrails” or “chemtrails” and there’s a whole lot of interesting information there. There’s a whole lot of information that runs the gamut from, “This is going on in order to cool the earth” to “this is interfering with crop production because the sun can’t get to the plants for photosynthesis. I think the Discovery Channel has done something on it. I think USA Today did something on it eight years ago. The EPA fact sheet is dated 2000. So there’s been a lot of discussion and conversation and speculation on this for a long, long time. As I indicated, we don’t have any jurisdiction in it, and we have more immediate concerns about what is going on in this community than up in the skies. Q Are you a scientist? Bob Colby I am not. Q Bob Colby, do you ever look at the scientific literature that touches on pollutants, or emissions, or carbon footprint generation and the like? What do you read? Bob Colby As it relates to what we do, yes. David Does any of that literature touch on any of the numerous overflights over Chattanooga and such phenomenon? David Tulis Well, two days ago, Chattanooga was heavily overflown by planes, all kinds of planes it seems to me that were not part of any normal traffic pattern, not very dull overflights that one would associate with a flight to Nashville or to Atlanta. There were many criss-crossing flights that left a lot of trailwork over Brainerd, where I was. It was a magnificent day; the sky was very bright, the cumulus formations all about were truly magnificent. *** It is something that is happening almost every day in Chattanooga. I am asking you in your official capacity: You don’t read anything in the literature that says there is something that we might need to be concerned about in some near future? Q Now the best of your sensors, which measure 2.5 microns and down, will measure something — will it measure something that is point zero zero zero one micron? That’s almost — what’s that? Is that the atomic level? Bob Colby I presume, since it’s smaller than 2.5. When you go from your office door at the end of the day at 5:30 to your car, Bob Colby, do you have any sense that the sun being less strong than it used to be? To me the sun seems really weak. It doesn’t seem to have any ferocity to it. But I don’t have much depth of memory on this question. Bob Colby I do not see any difference. I have been here all my life. Q You were born in Chattanooga? Q What is a particulate, and what do you do with them? Bob Colby Particulates are any sort of particle. It can come from smoke. It can come from organic chemicals. It can come from elements in the atmosphere that get there one way or another, usually through manmade activities. Sometimes winds will entrain particles in the atmosphere where they get up to where we can breathe them. The air pollution control bureau is responsible for achieving and maintaining such levels of air quality that will maintain human health and safety. We do that through a series of mechanisms. *** We measure fine particles and coarse particles, known as PM 2.5 microns for fine, and PM 10 for coarse. We also monitor that they do speciation on on those fine particles. They take a sample and ship it off to a laboratory and have it analyzed. It runs every six days. That gives us some indication as to the makeup of the fine particle pollution that we have in our area. I gave you some information in response to your open records request [for three years for aluminum, strontium and barium]. *** There is nothing unusual in it. We are showing trace amounts of those things that did appear. And even when we show something elevated, they’re still trace. But they’re increased, for instance, around the Fourth of July *** sometimes one our monitors will pick up, have elevated levels of fine particle pollution and we can **** see in a certain compound that is indicative particularly of fireworks. Q Your discourse makes the point that the theories of chemtrailing or geoengineering that I have been arguing for as a fact, a near-fact or a distinct possibility or a firm speculation really is not showing up in the evidence that you are charged by the county government and the city government to collect. Bob Colby We have seen nothing to indicate that that is occurring and I have no knowledge that it is occurring. David Tulis The New York Times on May 13 of this year has a story the quadrennial report there is stated a strong concern in military circles of the weather problem, the problem of climate change, the planet is getting warmer. The military is concerned about assets such as Norfolk Naval base. If it is underwater, that means docks and assets would be under the sea, the sea level rising in that theory. What do you make of this trend in the news? What can the government do for global warming? Bob Colby The vast body of scientific information is conclusive on, yes, we do have global climate change and that the earth is warming. The cause of that is manmade, and whether you agree with that or not, the facts seem to support their conclusions that the climate is changing and the earth is warming. The primary reason for that are greenhouse gases in the atmosphere. These come from many sources. Volcanos, naturally occurring. Water vapor is a greenhouse gas. These gases get up in the atmosphere and they create a blanket. And once radiation from the sun gets to the earth, it’s trapped in and can’t get out. Any combustion process that uses fossil fuel or petroleum create greenhouse gases. Any type of bruning will create greenhouse gases. One of the major greenhouse gas they are concerned about is carbon dioxide, which is what the plant take from us and give us oxygen. Q Could you tells us what a micron is and how your equipment detects pollutants that are that small? Q So the manufacturing of those devices and their use and maintenance are under federal rules and even federal certification. Bob Colby Absolutely. Every agency across the United States — there are approximately 165 local agencies and in 50 states and in territorial in possessions of the United States all use the same types of monitors. Under the same conditions. There are siting criteria [they have to meet]. They are very precise standards. David Tulis In your office as guardian of the air of the county, would you say you serve a compelling state interest or a public interest? Bob Colby I serve the citizens of Chattanooga and Hamilton County *** to be sure they have healthful air quality. Q And in enforcing federal law, you would say that that is only to the advantage of them as a whole, and to my listener? You are not asleep at the wheel. You are the soldier with the rifle over your soldier, in patrol as it were, and it is in his interest and his benefit to have you doing your work with the equipment you have. Bob Colby *** We were talking about greenhouse gases and climate change and temperature and the earth warming. U.S. EPA has started enforcing restrictions on greenhouse gas emissions. All new automobiles must meet certain standards to reduce greenhouse gas emissions from the tailpipes. And industrial sources are now being required to take steps to reduce greenhouse gas emissions, using the best practices to reduce greenhouse emissions. Those apply only to very large sources, because that is where the problem lies in EPA’s estimations. We are starting to see facilities actually wanting to reduce their emissions because it has become good for business to become green. Q It’s part of marketing their business? Bob Colby I think it helps their corporate bottom line. Q We were mentioning the military’s interest in global warming and what seems to be the idea that it’s becoming an emergency and crisis, and the military and its advisers in the corporate sector are saying that the crisis is so great that whole nations may disappear under the global warming crisis, the idea being that the ice caps will melt and the sea level will rise. Does your bureau have any position on how grave this prospect might be? Bob Colby No, we do not. We are not researchers. We are not scientists. We are regulators. We merely enforce the laws that we are told that need to be enforced. With respect to the military activity you referred to, if there is a coming problem, it will affect much more than militaries. It will affect all sorts of people, and one of the things I indicated to you is that FEMA is having to redo their flood maps because there are no more 100-year and 500-year flood plains. They are becoming more frequent than that. Q Bob, thank you very much. Bob Colby Absolutely. If anyone want to learn more about what we do, they can go online the apcb.org. Air pollution control bureau —apcb.org. — David Tulis hosts Nooganomics.com at Hot News Talk Radio 910 1190 and 1240 AM, a show 1 to 3 p.m. weekdays that covers local economy and free markets in Chattanooga and beyond.